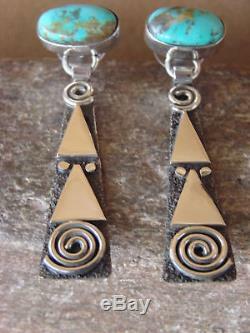 Native American Sterling Silver Turquoise Petroglyph Earrings by Alex Sanchez! 2 1/2" Long, 5 /8" Widest Point. 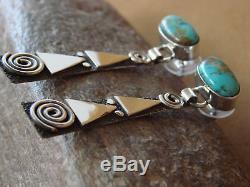 Navajo Indian Sterling Silver Petroglyph Earrings from Western New Mexico. 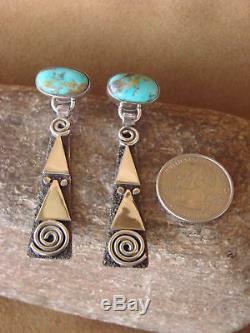 These earrings features beautiful hand cut petroglyph symbols throughout. The symbols are polished and have a great look. 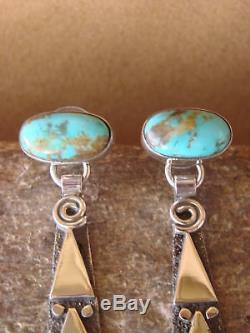 Each earring features a genuine Turquoise stone. 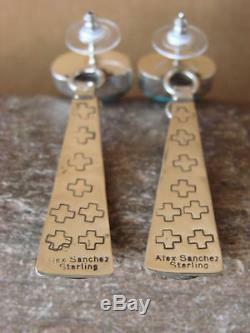 Handmade by well known Navajo Silversmith Alex Sanchez. Signed and stamped sterling on the back. We strive to be your number one source for Native American Jewelry, Pottery, Kachinas, and Fetishes. From high quality products to the best Customer Service on the internet. Built on the principles of doing the right thing we will never settle for less. We specialize in Navajo, Acoma, Zuni, and Pueblo Indian handmade goods. 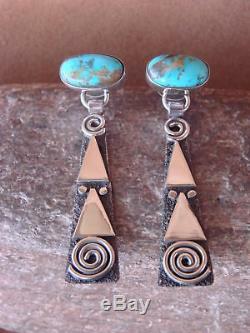 Living in New Mexico makes it convenient to deal directly with our Native American Artists. Every item is guaranteed to be authentic! All of our items are insured and carefully packaged in a box or padded envelope. The item "Native American Sterling Silver Turquoise Petroglyph Earrings by Alex Sanchez" is in sale since Friday, December 15, 2017. This item is in the category "Jewelry & Watches\Ethnic, Regional & Tribal\Native American\Earrings".